How many types of hot fix tape? Acrylic hot fix tape is cheaper, it is no problem to used for normal hot fix rhinestone motif,heat transfer printing,heat transfer film motif and glue film motif. 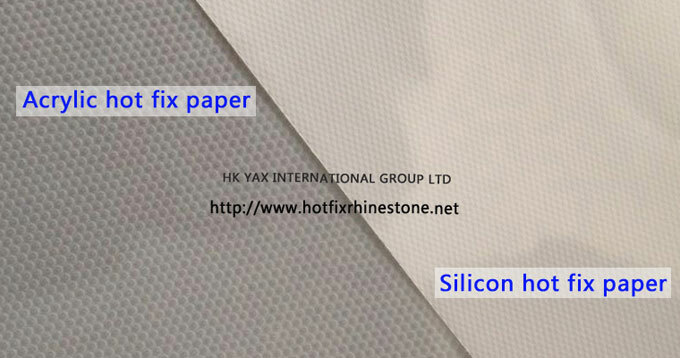 Silicon hot fix tape is expensive,it is mainly used for the products which have high requirements, for example,some rhinestones are easy to move place or one design mixed many kinds of sizes and colors rhinestones. In addition,some DIY hot fix motifs sold on Wal-Mart supermarket, they usually use silicon hot fix tape so that the customers can see a better effect without rhinestones move.